Made of a new material, soft and very durable, these disposable pillow cases are perfect for hotels, motels, hostels, inns, B&Bs, day care centres and unexpected visits from friends. The hypo-allergenic fabric, which is effective at preventing the spread of lice, bed bugs, bacteria and dust mites in pillows, mattresses, and other bedding materials, has no chemical or plastic smell, so guests are sure to enjoy a wonderful night's sleep, whether you use with another layer or not. After up to one month of use (or more, depending on the user's preferences), these pillow cases can be thrown away or recycled. They come individually packaged, so cleanliness and hygiene are guaranteed for every client. The pillow cases open in the middle of the underside, which means fast and easy deployment and an overall better level of protection coverage for both the pillow and the client. 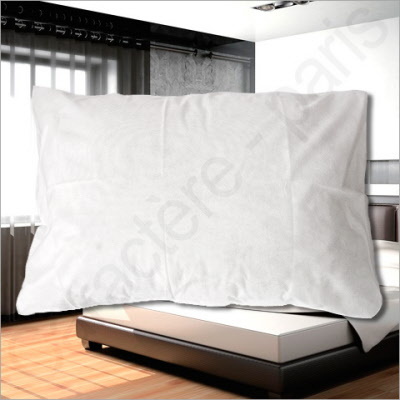 The pillow cases are over-sized, which ensures they will fit virtually all pillows sizes, such as the continental 65 x 65 cm / 26" x 26". For more standard UK pillow sizes, we also offer 45 x 65 cm / 18" x 26" and Oxford size: 50 x 75 cm / 20" x 30". 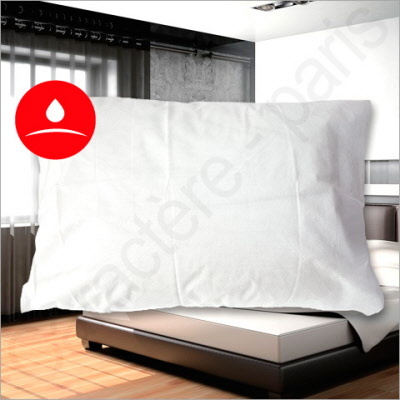 To protect pillows from water stains and other leaks while sleeping perfectly noiseless. A set of 5 comfortable and hygienic disposable pillows, with a filling made from 100% original materials!